LibreOffice announced the release of LibreOffice Online, a cloud-based installation of LibreOffice available for anyone to use. Collabora, the UK leader in the provision of commercial support solutions for Libreoffice released further information around the practicalities of implementing the Online version. 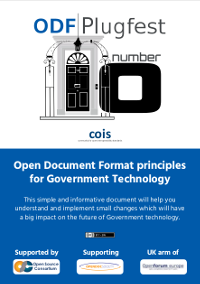 Yesterday, we saw the UK Government Digital Service release a blog summarising recent Government activity towards opening up documents. Also on the 27th, further guidance was released, restating the Government policy and providing resources to assist users and procurement with adherence to the policy. I was proud to be involved with a UK project to produce a toolkit with the objective of promoting the message that change is simple. Within hours, a German translation of the graphic was published and an unofficial Greek version created. The toolkit is available from the Open Forum Europe here and the Open Forum Press release can be downloaded from here. Karsten Gerloff, President of the Free Software Foundation Europe (FSFE), writes in his blog of how the FSFE celebrated Document Freedom Day with the Green group of the European Parliament. The event focussed on a recent study of the benefit to procurement transparency that can be achieved with Open Documents. The FSFE promoted their cartoon released for the 2012 Document Freedom day.The cartoon has many European translations and artwork can be downloaded here. Also making a repeat appearance this year was a graphic created by the French volunteer and member organisation, April. 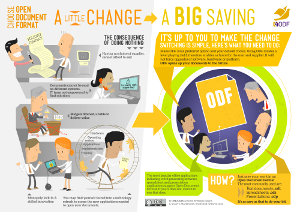 Their 2013 graphic describes how Open Document formats ensure the longevity of documents and can be downloaded here.